vancouver, yvr, flight deals, taipei, taiwan, tpe, asia, east asia, tokyo, japan, hnd, nrt, ana, all nippon airways and tsa. 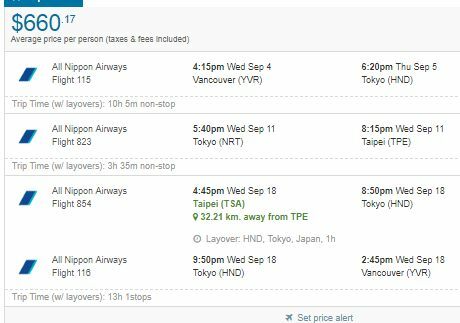 21 Responses to "2-in-1 trip: Vancouver (or Victoria) to Tokyo, Japan *and* Taiwan - $660 CAD roundtrip | ANA flights"
Is there any availability for Early december to even late January 2020 travel? I'm trying to play around with the dates. If that helps anyone looking around Christmas/New Years time. For only $659.59. Super happy. Thanks Chris!!! This website is the best. Been trying for the last half an hour and its 900+ :'( If anyone has any available dates any time please do post it. Thanks Chris, but nothing is even close to $600. It looks like the deals are usually posted early in the morning when everyone is sleeping on the West Coast ???? 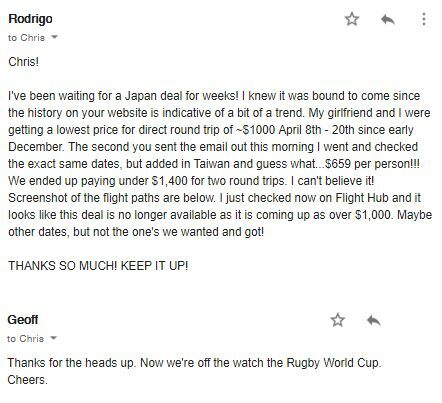 Hi Chris, what exact dates did you use for Skyscanner? Thank you ! Dang, had one at $618 but took too long to book. It looks like this deal is over now (can't find anything lower than $880). Bonnie: I just tried Skyscanner again (1 PM PST) - and September dates don't seem to be working any more. Nov 20 to Nov 27 to Dec 4 is still working, but it's showing 1 ticket remaining when you click through. This one might be just about over - I'll post any working dates here if I find any. We are now trying those dates and they work! But we to extend to to 2 weeks in Japan. Trying dates, No avail yet. Booked this morning at $659.69. Thanks for sharing Chris! Booked this morning out of Vancouver in April. $659 each!!! Looks like this was a very limited deal, at least for April, because the prices for the exact same flights shot up again to over $1,000 a few hours later. Man, those flights went fast! So sad! i saw this , i decided to book a flight tonight now is gone! This will be my third year in a row using your tips to get affordable flights! Thanks for this tip off was able to get the deal but booked before 10:00 am the same day this was posted. Thanks for all your tips Chris!